Vandal Athletic Gear, founded by brothers Willie and Michael Lewis, started off as just a t-shirt company. As Willie, who also works in corrections for the Indian River County Sheriff's Department, shared, the company morphed into a brand that encompasses much more than just active wear for Mixed Martial Arts (MMA) and combat sports enthusiasts. "Even though we officially launched about two and a half years ago, we first started thinking about the idea back in 2012," he said. "At first, we wanted unique shirts geared towards the MMA and combat sports community. Along the way, we started to envision something different besides your average combat t-shirt. We wanted it to be inspirational yet rugged enough for the combat community. Over the years of working on the brand, we realized that Vandal was much more than just a combat t-shirt." According to Willie, Vandal Athletic Gear is a brand for everyone because, "In everyday life we fight, and all of us have our own challenges in life that take place outside of a cage or ring." The brothers wanted athletic gear that spoke to everyone and made them feel empowered when they wore it. What they came up with was a collection of lightweight hoodies, dry-fit shirts, motivational shirts with quotes on the back, fighting gear, boxing gloves and coming in December, a collection of snapback hats. Their aim is to provide good quality sport and street wear without the inflated prices. Willie shared his source of inspiration and the meaning behind the brand name. "I love to stay active," he said. "That includes going to the gym and working out. Certain types of clothing drive me to workout harder. The Vandals were warriors in the Roman times. When I'm wearing our gear, I'm a warrior in whatever I'm doing. When other people learn that the Vandals were warriors, they love the brand even more." 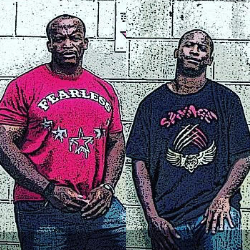 Looking ahead, Willie and Michael are focused on expanding locally by doing more promotions and lower-level MMA shows. They also want to extend their reach beyond the fighting and athletic communities by attending more business expos and networking events. Once they solidify their local reputation and become a well known brand along the Treasure Coast, they plan to expand to other areas including Orlando and Miami. The possibility of quitting their day jobs and working full-time on Vandal is not something they've ruled out. Michael currently works as an art teacher for a private school in Port St. Lucie. Willie shared some lessons learned and excellent advice for aspiring entrepreneurs. "This business is a lot more than just printing and selling clothes," he said. "With any business really, you have to get your name, tax ID, funding in place and legal stuff setup. There's a lot that goes into the paper side of things. Also, it's important to remember that, no matter how good your clothing is, it's all about promotion and getting your brand out to the masses. Once you get your product out there, it's not a quick money thing. Your business has to be something you love to do. You'll have ups and downs and times you think to yourself, 'Is this really worth it?'. You might even want to quit, but don't. Anytime I've ever had that thought, I've had someone reach out and ask about our products. Just be patient and don't rush things."